The laparoscopic approach to liver resection has experienced exponential growth in recent years. However, evidence-based guidelines are needed for its safe future progression. The main aim of our study was to perform a systematic review and meta-analysis comparing the short- and long-term outcomes of laparoscopic and open liver resections for colorectal liver metastases (CRLM). 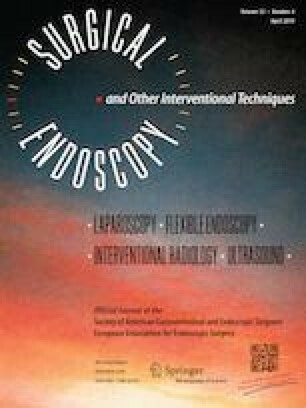 To identify all the comparative manuscripts between laparoscopic and open liver resections for CRLM, all published English language studies with more than ten cases were screened. In addition to the primary meta-analysis, 3 specific subgroup analyses were performed on patients undergoing minor-only, major-only and synchronous resections. The quality of the studies was assessed using the Scottish Intercollegiate Guidelines Network (SIGN) methodology and Newcastle–Ottawa Score. From the initial 194 manuscripts identified, 21 were meta-analysed, including results from the first randomized trial comparing open and laparoscopic resections of CRLM. Five of these were specific to patients undergoing a synchronous resection (399 cases), while six focused on minor (3 series including 226 cases) and major (3 series including 135 cases) resections, respectively. Thirteen manuscripts compared 2543 cases but could not be assigned to any of the above sub-analyses, so were analysed independently. The majority of short-term outcomes were favourable to the laparoscopic approach with equivalent rates of negative resection margins. No differences were observed between the approaches in overall or disease-free survival at 1, 3 or 5 years. Laparoscopic liver resection for CRLM offers improved short-term outcomes with comparable long-term outcomes when compared to open approach. Manuscript and research performed in the context of the European Guidelines Meeting of Laparoscopic Liver Surgery held in Southampton-United Kingdom from the 9th to 11th of February 2017. The online version of this article ( https://doi.org/10.1007/s00464-019-06774-2) contains supplementary material, which is available to authorized users. Ruben Ciria, Sira Ocaña and Irene Gomez-Luque have equally contributed to the development of this manuscript. Drs. Ciria, Ocaña, Gómez-Luque, Cipriani, Halls, Fretland, Okuda, Aroori, Briceño, Aldrighetti, Edwin and Abu Hilal have no conflicts of interest or financial ties to disclose.